Chocolate and teddy bears are perfectly sweet, but there’s nothing quite as romantic as sharing an experience together on Valentine’s Day. 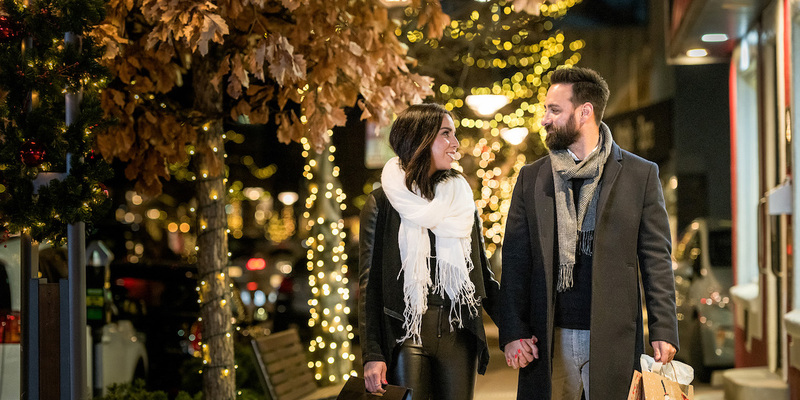 Imagine your perfect date night: Does it involve holding hands as you walk tree-lined streets, shopping at unique retail shops and art galleries, and dining at restaurants found nowhere else in Denver? 1. Charm your Valentine with more than 100 years of history. As you wander toward your first date night destination, impress your sweetheart with this little trivia tidbit from Denver Public Library: More than 140 years ago, Cherry Creek was once part of the small town of Harman, founded in 1872 by two lovebirds—a Confederate war veteran and his wife. 2. Share some happiness at happy hour. More than 20 of Cherry Creek North’s restaurants and bars offer happy hour specials. Not only is it the perfect excuse to start the night early with your sweetheart, you’ll also score some great deals on dining and drinks. 3. Enjoy a long and romantic walk. Those tree-lined streets we mentioned? There are 16 blocks of them. Whether you’re simply window shopping or walking off an indulgent dinner, there's so much here to explore. 4. Show your sweetheart an authentically Denver experience. Of the more than 250 retail and service businesses here, 70 percent of those are small, local businesses. From independent bookstores and gift shops with Colorado-made collectables and jewelry, to locally-owned restaurants to please every palate, it’s the perfect opportunity for a one-of-a-kind shopping and dining experience. 5. Delight in surprises around every corner. From secret speakeasies to whimsical window displays and outdoor sculptures, you never know what you might find here—and there’s nothing more romantic than the element of surprise. Bonus tip: There are eight parking garages that offer $5 parking on nights and weekends!